Looking for an easy, filling, and absurdly high-protein pasta dinner you can serve to anyone without shame? Maybe you just didn't know you were looking for one. But this one just found you. And it's delicious! That information alone may be enough to make your day. So sure, trawl the net, and you can find endless ricotta pasta variations. Or you can just cut to the chase and make this classic from The Kitchn. It never fails to be a hit for kids and adults alike, but you can also secretly send the protein content sky-high by making one simple substitution: Use edamame pasta, such as the stellar one-ingredient variation made by Explore Asian cuisine, which has 24 grams of protein in a 2-ounce serving. Frealz! I know what you're thinking: Alternative pastas made of, say, corn or rice often end up tasting...alternative, and cold leftovers the next day are pretty much inedible. 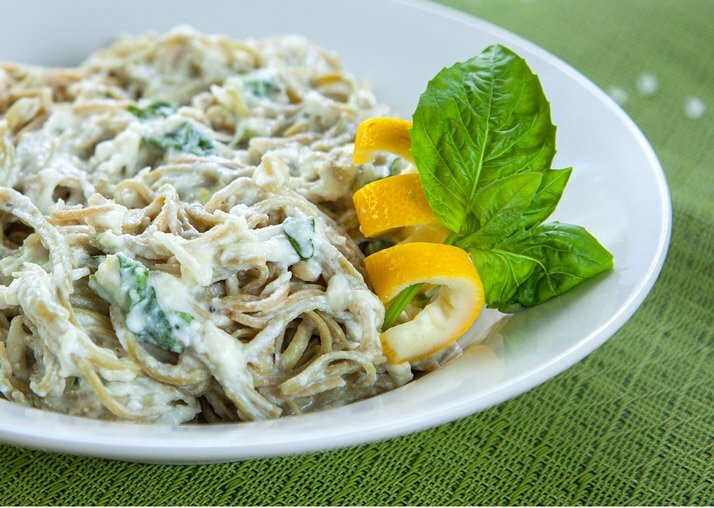 Edamame pasta, however, has excellent texture and a slightly nutty flavor highly reminiscent of Japanese soba noodles. Explore Asian's variation plays up this similarity since the noodles are quite thin, like soba noodles or even angel hair pasta. This also means they cook in about half the time of traditional wheat-based pastas. And in this recipe, they're great cold for lunch the next day.